Occitan (English: /ˈɒksɪtən, -tæn, -tɑːn/, Occitan: [utsiˈta],[a] French: [ɔksitɑ̃]), also known as lenga d'òc (Occitan: [ˈleŋɡɔ ˈðɔ(k)] ( listen); French: langue d'oc) by its native speakers, is a Romance language. It is spoken in southern France, Italy's Occitan Valleys, Monaco, and Spain's Val d'Aran; collectively, these regions are sometimes referred to as Occitania. Occitan is also spoken in the linguistic enclave of Guardia Piemontese (Calabria, Italy). However, there is controversy about the unity of the language, as some think that Occitan is a macrolanguage. Others include Catalan in this family, as the distance between this language and some Occitan dialects (such as the Gascon language) is similar to the distance among different Occitan dialects. In fact, Catalan was considered an Occitan dialect until the end of the 19th century. Carolingian litanies (c. 780), both written and sung in Latin, were answered to in Old Occitan by the audience (Ora pro nos; Tu lo juva). Other famous pieces include the Boecis, a 258-line-long poem written entirely in the Limousin dialect of Occitan between the year 1000 and 1030 and inspired by Boethius's The Consolation of Philosophy; the Waldensian La nobla leyczon (dated 1100), la Cançó de Santa Fe (c. 1054–1076), the Romance of Flamenca (13th century), the Song of the Albigensian Crusade (1213–1219? ), Daurel e Betó (12th or 13th century), Las, qu'i non sun sparvir, astur (11th century) and Tomida femina (9th or 10th century). Occitan was the vehicle for the influential poetry of the medieval troubadours (trovadores) and trobairitz: At that time, the language was understood and celebrated throughout most of educated Europe. It was the maternal language of the English queen Eleanor of Aquitaine and kings Richard I of England (who wrote troubadour poetry) and John, King of England. With the gradual imposition of French royal power over its territory, Occitan declined in status from the 14th century on. By the Ordinance of Villers-Cotterêts (1539) it was decreed that the langue d'oïl (French - though at the time referring to the Francien language and not the larger collection of dialects grouped under the name Langues d'oïl) should be used for all French administration. Occitan's greatest decline was during the French Revolution, during which diversity of language was considered a threat. In 1903 the four Gospels Lis Evangèli i.e. Matthew, Mark, Luke and John were translated into the form of Provençal spoken in Cannes and Grasse. This was given the official Roman Catholic Imprimatur by A. Estellon, vicar general. The literary renaissance of the late 19th century (which included a Nobel Prize for Frédéric Mistral) was attenuated by World War I, when Occitan speakers spent extended periods of time alongside French-speaking comrades. Linguistic evolution in southwest Europe from 1000-2000 C.E. Because the geographical territory in which Occitan is spoken is surrounded by regions in which other Romance languages are used, external influences could have influenced its origin and development. Many factors favoured its development as a language of its own. Mountains and seas: The range of Occitan is bounded naturally by the Mediterranean Sea, the Atlantic Ocean, the Massif Central, the Pyrenees, and the Alps. Buffer zones: Arid land, marshes, and areas otherwise impractical for farming and resistant of colonization provide further separation (territory between Loire and Garonne, the Aragon desert plateau). Ancient and long-term Roman influence: Julius Caesar once said that the people of Aquitaine could teach the Romans themselves to speak Latin more correctly. According to Müller, "France's linguistic separation began with Roman influence"
A separate lexicon: Although Occitan is midway between the Gallo-Romance and Iberian Romance languages, it has "around 550 words inherited from Latin that do not exist in the langues d'oïl or in Franco-Provençal"
Little germanization: "The Frankish lexicon and its phonetic influence often end above the oc/oïl line"
Catalan in Spain's northern and central Mediterranean coastal regions and the Balearic Islands is closely related to Occitan, sharing many linguistic features and a common origin (see Occitano-Romance languages). The language was one of the first to gain prestige as a medium for literature among Romance languages in the Middle Ages. Indeed, in the 12th and 13th centuries, Catalan troubadours such as Guerau de Cabrera, Guilhem de Bergadan, Guilhem de Cabestany, Huguet de Mataplana, Raimon Vidal de Besalú, Cerverí de Girona, Formit de Perpinhan, and Jofre de Foixà wrote in Occitan. At the end of the 11th century, the Franks, as they were called at the time, started to penetrate the Iberian Peninsula through the Ways of St. James via Somport and Roncesvalles, settling on various spots of the Kingdoms of Navarre and Aragon enticed by the privileges granted them by the Navarrese kings. They established themselves in ethnic boroughs where Occitan was used for everyday life, e.g. Pamplona, Sangüesa, Estella-Lizarra, etc. The language in turn became the status language chosen by the Navarrese kings, nobility, and upper classes for official and trade purposes in the period stretching from the early 13th century to late 14th century. These boroughs in Navarre may have been close-knit communities with little mingling, in a context where the natural milieu was predominantly Basque-speaking. The variant chosen for written administrative records was a koiné based on the Languedocien dialect from Toulouse with fairly archaic linguistic features. Evidence of a written account in Occitan from Pamplona revolving around the burning of borough San Nicolas from 1258 survives today, while the History of the War of Navarre by Guilhem Anelier (1276) albeit written in Pamplona shows a linguistic variant from Toulouse. Things turned out slightly otherwise in Aragon, where the sociolinguistic situation was different, with a clearer Basque-Romance bilingual situation (cf. Basques from the Val d'Aran cited c. 1000), but a receding Basque language (Basque banned in the marketplace of Huesca, 1349). While the language was chosen as a medium of prestige in records and official statements along with Latin in the early 13th century, Occitan faced competition from the rising local Romance vernacular, the Navarro-Aragonese, both orally and in writing, especially after Aragon's territorial conquests south to Zaragoza, Huesca and Tudela between 1118 and 1134. It resulted that a second Occitan immigration of this period was assimilated by the similar Navarro-Aragonese language, which at the same time was fostered and chosen by the kings of Aragon. The language fell into decay in the 14th century across the whole southern Pyrenean area and became largely absorbed into Navarro-Aragonese first and Castilian later in the 15th century, after their exclusive boroughs broke up (1423, Pamplona's boroughs unified). Gascon-speaking communities were called in for trading purposes by Navarrese kings in the early 12th century to the coastal fringe extending from San Sebastian to the Bidasoa River, where they settled down. The language variant used was different from the ones used in Navarre, i.e. a Béarnese dialect of Gascon, with Gascon being in use far longer than in Navarre and Aragon until the 19th century, thanks mainly to the close ties held by Donostia and Pasaia with Bayonne. Though it was still an everyday language for most of the rural population of southern France well into the 20th century, it is now spoken by about 100,000 people in France according to 2012 estimates. According to the 1999 census, there were 610,000 native speakers (almost all of whom are also native French speakers) and perhaps another million persons with some exposure to the language. Following the pattern of language shift, most of this remainder is to be found among the eldest populations. Occitan activists (called Occitanists) have attempted, in particular with the advent of Occitan-language preschools (the Calandretas), to reintroduce the language to the young. Nonetheless, the number of proficient speakers of Occitan is dropping precipitously. 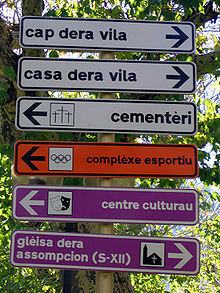 A tourist in the cities in southern France is unlikely to hear a single Occitan word spoken on the street (or, for that matter, in a home), and is likely to only find the occasional vestige, such as street signs (and, of those, most will have French equivalents more prominently displayed), to remind them of the traditional language of the area. Occitans, as a result of more than 200 years of conditioned suppression and humiliation (see Vergonha), seldom speak their own language in the presence of foreigners, whether they are from abroad or from outside Occitania (in this case, often merely and abusively referred to as Parisiens or Nordistes, which means northerners). Occitan is still spoken by many elderly people in rural areas, but they generally switch to French when dealing with outsiders. Occitan's decline is somewhat less pronounced in Béarn because of the province's history (a late addition to the Kingdom of France), though even there the language is little spoken outside the homes of the rural elderly. The village of Artix is notable for having elected to post street signs in the local language. In the Val d'Aran, in the northwest corner of Catalonia, Spain, Aranese (a variety of Gascon) is spoken. It is an official language of Catalonia together with Catalan and Spanish. In Italy, Occitan is also spoken in the Occitan Valleys (Alps) in Piedmont and Liguria. An Occitan-speaking enclave also has existed at Guardia Piemontese (Calabria) since the 14th century. Italy adopted in 1999 a Linguistic Minorities Protection Law, or "Law 482", which includes Occitan; however, Italian is the dominant language. It should be noted that the Piedmontese language is extremely close to Occitan. In Monaco, some Occitan speakers coexist with remaining native speakers of Monégasque (Ligurian). French is the dominant language. There were Occitan-speaking colonies in Württemberg (Germany) since the 18th century, as a consequence of the Camisard war. The last Occitan speakers were heard in the 1930s. In the Spanish Basque country, Gascon was spoken in the centre of Donostia-San Sebastián, perhaps until the beginning of the 20th century. in Canada, in Quebec where there are Occitan associations such as Association Occitane du Québec and Association des Occitans. Pigüé, Argentina – Community settled by 165 Occitans from the Rodez-Aveyron area of Cantal in the late 19th century. Guanajuato, Mexico – A sparse number of Occitan settlers are known to have settled in that state in the 19th century. Aquitaine – excluding the Basque-speaking part of the Pyrénées-Atlantiques in the western part of the department and a small part of Gironde where the langue d'oïl Saintongeais dialect is spoken. Midi-Pyrénées – including one of France's largest cities, Toulouse. 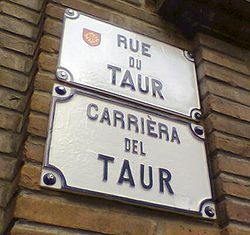 There are a few street signs in Toulouse in Occitan, and since late 2009 the Toulouse Metro announcements are bilingual French-Occitan, but otherwise the language is almost never heard spoken on the street. Languedoc-Roussillon (from "Lenga d'òc") – including the areas around the medieval city of Carcassonne, excluding the large part of the Pyrénées-Orientales where Catalan is spoken (Fenolheda is the only Occitan-speaking area of the Pyrénées-Orientales). Provence-Alpes-Côte d'Azur – except for the Roya and Bévéra valleys, where there is a transitional dialect between Ligurian and Occitan, (Roiasc, including the Brigasc dialect of Ligurian). In the department of Alpes-Maritimes there were once isolated towns that spoke Ligurian, but those varieties are now extinct. The Mentonasc dialect of Ligurian, spoken in Menton, is a Ligurian transition dialect with a strong Occitan influence. In Monaco, Occitan, imported by immigrants coexisted in the 19th and 20th centuries with the Monégasque dialect of Ligurian. French is the dominant language. Poitou-Charentes – Use of Occitan has declined here in the few parts it used to be spoken, replaced by French. Only Charente Limousine, the eastern part of the region, has resisted. The natural and historical languages of most of the region are the langues d'oïl Poitevin and Saintongeais. Limousin – A rural region (about 710,000 inhabitants) where Limousin is still spoken among the oldest residents. Auvergne – The language's use has declined in some urban areas. The department of Allier is divided between a southern, Occitan-speaking area and a northern, French-speaking area. Centre-Val de Loire – Some villages in the extreme South speak Occitan. Rhône-Alpes – While the south of the region is clearly Occitan-speaking, the central and northern Lyonnais, Forez and Dauphiné parts belong to the Franco-Provençal language area. Occitan Valleys (Piedmont) – Italian region where Occitan is spoken only in the southern and central Alpine valleys. Val d'Aran – part of Catalonia that speaks a mountain dialect of Gascon. The area where Occitan was historically dominant has approximately 16 million inhabitants. Recent research has shown it may be spoken as a first language by approximately 789,000 people in France, Italy, Spain and Monaco. In Monaco, Occitan coexists with Monégasque Ligurian, which is the other native language. Some researchers state that up to seven million people in France understand the language, whereas twelve to fourteen million fully spoke it in 1921. 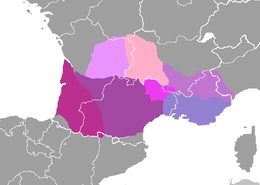 In 1860, Occitan speakers represented more than 39% of the whole French population (52% for francophones proper); they were still 26% to 36% in the 1920s and fewer than 7% in 1993. Gascon is the most divergent, and descriptions of the main features of Occitan often consider Gascon separately. Max Wheeler notes that "probably only its copresence within the French cultural sphere has kept [Gascon] from being regarded as a separate language", and compares it to Franco-Provençal, which is considered a separate language from Occitan but is "probably not more divergent from Occitan overall than Gascon is". There is no general agreement about larger groupings of these dialects. According to this view, Catalan is an ausbau language that became independent from Occitan during the 13th century, but originates from the Aquitano-Pyrenean group. Domergue Sumien proposes a slightly different supradialectal grouping. All these regional varieties of the Occitan language are written and valid. Standard Occitan, also called occitan larg (i.e., 'wide Occitan') is a synthesis that respects and admits soft regional adaptations (which are based on the convergence of previous regional koinés). So Occitan can be considered as a pluricentric language. The standardisation process began with the publication of Gramatica occitana segon los parlars lengadocians, grammar of the languedocien dialect, by Louis Alibert (1935), followed by the Dictionnaire occitan-français selon les parlers languedociens (French-Occitan dictionary according to Languedocien) by the same author (1966), completed during the 1970s with the works of Pierre Bec (Gascon), Robèrt Lafont (Provençal) and others. But it has not been achieved yet[clarification needed]. It is mostly supported by users of the classical norm. Due to the strong situation of diglossia, some users still reject the standardisation process and do not conceive Occitan as a language that could work just as other standardised languages. There are two main linguistic norms currently used for Occitan, one (known as "classical"), which is based on that of Medieval Occitan, and one (sometimes known as "Mistralian", due to its use by Frédéric Mistral), which is based on modern French orthography. Sometimes, there is conflict between users of each system. The classical norm (or less exactly classical orthography) has the advantage of maintaining a link with earlier stages of the language, and reflects the fact that Occitan is not a variety of French. It is used in all Occitan dialects. It also allows speakers of one dialect of Occitan to write intelligibly for speakers of other dialects (e.g. the Occitan for day is written jorn in the classical norm, but could be jour, joun, journ, or even yourn, depending on the writer's origin, in Mistralian orthography). The Occitan classical orthography and the Catalan orthography are quite similar: They show the very close ties of both languages. The digraphs lh and nh, used in the classical orthography, were adopted by the orthography of Portuguese, presumably by Gerald of Braga, a monk from Moissac, who became bishop of Braga in Portugal in 1047, playing a major role in modernizing written Portuguese using classical Occitan norms. The Mistralian norm (or less exactly Mistralian orthography) has the advantage of being similar to that of French, in which most Occitan speakers are literate. Now, it is used mostly in the Provençal/Niçard dialect, besides the classical norm. It has also been used by a number of eminent writers, particularly in Provençal. However, it is somewhat impractical, because it is based mainly on the Provençal dialect and also uses many digraphs for simple sounds, the most notable one being ou for the [u] sound, as it is in French, written as o under the classical orthography. There are also two other norms but they have a lesser audience. The Escòla dau Pò norm (or Escolo dóu Po norm) is a simplified version of the Mistralian norm and is used only in the Occitan Valleys (Italy), besides the classical norm. The Bonnaudian norm (or écriture auvergnate unifiée, EAU) was created by Pierre Bonnaud and is used only in the Auvergnat dialect, besides the classical norm. Touti li persouna naisson liéuri e egali en dignità e en drech. Soun doutadi de rasoun e de counsciència e li cau agì entre eli em' un esperit de frairessa. Toutes les persounes naisoun liures e egales en dignità e en drech. Soun douta de razoun e de counsiensio e lour chal agir entre eels amb (/bou) un esperit de freireso. Totas las personas naisson liuras e egalas en dignitat e en drech. Son dotadas de rason e de consciéncia e lor chau (/fau/) agir entre elas emb un esperit de frairesa. Note that that Catalan version was translated from the Spanish, while the Occitan versions were translated from the French. The second part of the Catalan version may also be rendered as "Són dotades de raó i de consciència, i els cal actuar entre si amb un esperit de fraternitat", showing the similarities between Occitan and Catalan. Many Occitan linguists and writers, particularly those involved with the pan-Occitan movement centred on the Institut d'Estudis Occitans, disagree with the view that Occitan is a family of languages and think that Limousin, Auvergnat, Languedocien, Gascon, Provençal and Vivaro-Alpine are dialects of a single language. Although there are indeed noticeable differences between these varieties, there is a very high degree of mutual intelligibility between them; they also share a common literary history, and in academic and literary circles, have been identified as a collective linguistic entity—the lenga d'òc—for centuries. Some Provençal authors continue to support the view that Provençal is a separate language. Nevertheless, the vast majority of Provençal authors and associations think that Provençal is a part of Occitan. This debate about the status of Provençal should not be confused with the debate concerning the spelling of Provençal. The classical orthography is phonemic and diasystemic, and thus more pan-Occitan. It can be used for (and adapted to) all Occitan dialects and regions, including Provençal. Its supporters think that Provençal is a part of Occitan. The Mistralian orthography of Provençal is more or less phonemic but not diasystemic and is closer to the French spelling and therefore more specific to Provençal; its users are divided between the ones who think that Provençal is a part of Occitan and the ones who think that Provençal is a separate language. For example, the classical system writes Polonha, whereas the Mistralian spelling system has Poulougno, for [puˈluɲo], 'Poland'. The question of Gascon is similar. Gascon presents a number of significant differences from the rest of the language; but, despite these differences, Gascon and other Occitan dialects have very important common lexical and grammatical features, so authors such as Pierre Bec argue that they could never be considered as different as, for example, Spanish and Italian. In addition, Gascon's being included in Occitan despite its particular differences can be justified because there is a common elaboration (Ausbau) process between Gascon and the rest of Occitan. The vast majority of the Gascon cultural movement considers itself as a part of the Occitan cultural movement. And the official status of Val d'Aran (Catalonia, Spain), adopted in 1990, says that Aranese is a part of Gascon and Occitan. A grammar of Aranese by Aitor Carrera, published in 2007 in Lleida, presents the same view. The exclusion of Catalan from the Occitan sphere, even though Catalan is closely related, is justified because there has been a consciousness of its being different from Occitan since the later Middle Ages and because the elaboration (Ausbau) processes of Catalan and Occitan (including Gascon) have been quite distinct since the 20th century. Nevertheless, other scholars point out that the process that led to the affirmation of Catalan as a distinct language from Occitan started during the period when the pressure to include Catalan-speaking areas in a mainstream Spanish culture was at its greatest. The answer to the question of whether Gascon or Catalan should be considered dialects of Occitan or separate languages has long been a matter of opinion or convention, rather than based on scientific ground. However, two recent studies support Gascon's being considered a distinct language. For the very first time, a quantifiable, statistics-based approach was applied by Stephan Koppelberg in attempt to solve this issue. Based on the results he obtained, he concludes that Catalan, Occitan, and Gascon should all be considered three distinct languages. More recently, Y. Greub and J.P. Chambon (Sorbonne University, Paris) demonstrated that the formation of Proto-Gascon was already complete at the eve of the 7th century, whereas Proto-Occitan was not yet formed at that time. These results induced linguists to do away with the conventional classification of Gascon, favoring the "distinct language" alternative. Both studies supported the early intuition of late Kurt Baldinger, a specialist of both medieval Occitan and medieval Gascon, who recommended that Occitan and Gascon be classified as separate languages. However, this statement[which?] hurts the Occitanist doctrine, which states as one of its fundamental dogmas, that Gascon is a dialect of Occitan, so linguists of the Occitanist movement tend not to take these studies into account. Jules Ronjat has sought to characterize Occitan by 19 principal criteria, as generalized as possible. Of those, 11 are phonetic, five morphologic, one syntactic, and two lexical. Close rounded vowels are rare or absent in Occitan. This characteristic often carries through to an Occitan speaker's French, leading to a distinctive méridional accent. Unlike French, it is a pro-drop language, allowing the omission of the subject (canti: I sing; cantas you sing). Among these 19 discriminating criteria, 7 are different from Spanish, 8 from Italian, 12 from Franco-Provençal, and 16 from French. Most features of Occitan are shared with either French or Catalan, or both. Latin ū [uː] (Vulgar Latin /u/) changed to /y/, as in French (Lat. dūrvm > Oc. dur). Stressed Latin a was preserved (Lat. mare > Oc. mar, Fr. mer). Intervocalic -t- was lenited to /d/ rather than lost (Lat. vitam > Oc. vida, Fr. vie). Final /a/ becomes /ɔ/ (note in Valencian (Catalan), /ɔ/ may appear in word-final unstressed position, in a process of vowel harmony). Low-mid /ɛ/ and /ɔ/ diphthongized before velars. /ɛ/ generally becomes /jɛ/; /ɔ/ originally became /wɔ/ or /wɛ/, but has since usually undergone further fronting (e.g. to [wœ], [œ], [ɛ], etc.). Diphthongization also occurred before palatals, as in French and Catalan. Various assimilations in consonant clusters (e.g. ⟨cc⟩ in Occitan, pronounced /utsiˈta/ in conservative Languedocien). Palatalization of ca-, ga- to /tʃa, dʒa/. Vocalization of syllable-final /l/ to /w/. Vocalization of syllable-final nasals to nasal vowels. Uvularization of some or all ⟨r⟩ sounds. Latin -mb-,-nd- become /m, n/. Betacism: /b/ and /v/ merge (feature shared with some Catalan dialects; except for Balearic, Valencian and Alguerese Catalan, where /v/ is preserved). Intervocalic voiced stops /b d ɡ/ (from Latin -p-, -t, -c-) become voiced fricatives [β ð ɣ]. Loss of word-final single /n/ (but not /nn/, e.g. an "year" < ānnvm). Latin initial /f/ changed into /h/ (Lat. filivm > Gasc. hilh). This also happened in medieval Spanish, although the /h/ was eventually lost, or reverted to /f/ (before a consonant). The Gascon ⟨h⟩ has retained its aspiration. Loss of /n/ between vowels. This also happened in Portuguese and Galician (and moreover also in Basque). Change of -ll- to ⟨r⟩ /ɾ/, or ⟨th⟩ word-finally (originally the voiceless palatal stop /c/, but now generally either /t/ or /tʃ/, depending on the word). This is a unique characteristic of Gascon and of certain Aragonese dialects. Merging of syllable-final nasals to /ŋ/. This appears to represent a transitional stage before nasalization, and occurs especially in the southerly dialects other than Gascon (which still maintains different final nasals, as in Catalan). Former intervocalic /ð/ (from Latin -d-) becomes /z/ (most dialects, but not Gascon). This appears to have happened in primitive Catalan as well, but Catalan later deleted this sound or converted it to /w/. Palatalization of /jt/ (from Latin ct) to /tʃ/ in most dialects or /(j)t/: lach vs lait (Gascon lèit) 'milk', lucha vs luta (Gascon luta) 'fight'. Weakening of /l/ to /r/ in the Vivaro-Alpine dialect. Some have claimed around 450,000 words exist in the Occitan language, a number comparable to English (the Webster's Third New International Dictionary, Unabridged with 1993 addenda reaches 470,000 words, as does the Oxford English Dictionary, Second edition). The Merriam-Webster Web site estimates that the number is somewhere between 250,000 and 1 million words. The magazine Géo (2004, p. 79) claims that American English literature can be more easily translated into Occitan than French, excluding modern technological terms that both languages have integrated. A comparison of the lexical content can find more subtle differences between the languages. For example, Occitan has 128 synonyms related to cultivated land, 62 for wetlands, and 75 for sunshine (Géo). The language went through an eclipse during the Industrial Revolution, as the vocabulary of the countryside became less important. At the same time, it was disparaged as a patois. Nevertheless, Occitan has also incorporated new words into its lexicon to describe the modern world. The Occitan word for web is oèb, for example. One interesting and useful feature of the Occitan language is its virtually infinite ability to create new words through a number of interchangeable and embeddable suffixes, giving the original terms a whole array of semantic nuances. Standard Catalan (based on Central Eastern Catalan) is unique in that Latin short e developed into a close vowel /e/ (é) and Latin long e developed into an open vowel /ɛ/ (è); that is precisely the reverse of the development that took place in Western Catalan dialects and the rest of the Romance languages, including Occitan. Thus Standard Catalan ésser [ˈesə] corresponds to Occitan èsser/èstre [ˈɛse/ˈɛstre] 'to be;' Catalan carrer [kəˈre] corresponds to Occitan carrièra [karˈjɛɾo̞] 'street', but it is also carriera [karˈjeɾo̞], in Provençal. The distinctly Occitan development of word-final -a, pronounced [o̞] in standard Occitan (chifra 'figure' [ˈtʃifro̞]), did not occur in general Catalan (which has xifra [ˈʃifrə]). However, some Occitan varieties also lack that feature, and some Catalan (Valencian) varieties have the [ɔ] pronunciation, mostly by vowel harmony. When in Catalan word stress falls in the antepenultimate syllable, in Occitan the stress is moved to the penultimate syllable: for example, Occitan pagina [paˈdʒino̞] vs. Catalan pàgina [ˈpaʒinə], "page". However, some varieties of Occitan (such as around Nice) keep the stress on the antepenultimate syllable (pàgina), and some varieties of Catalan (in Northern Catalonia) put the stress on the penultimate syllable (pagina). Diphthongisation has evolved in different ways: Occitan paire vs. Catalan pare 'father;' Occitan carrièra (carrèra, carrèira) vs. Catalan carrera. Some Occitan dialects lack the voiceless postalveolar fricative phoneme /ʃ/, but south-western Occitan has it: general Occitan caissa [ˈkajso̞] vs. Catalan caixa [ˈkaʃə] and south-western Occitan caissa, caisha [ˈka(j)ʃo̞], 'box.' Nevertheless, some Valencian dialects like Northern Valencian lack that phoneme too and generally substitute /jsʲ/: caixa [ˈkajʃa] (Standard Valencian) ~ [ˈkajsʲa] (Northern Valencian). Occitan has developed the close front rounded vowel /y/ as a phoneme, often (but not always) corresponding to Catalan /u/: Occitan musica [myˈziko̞] vs. Catalan música [ˈmuzikə]. The distribution of palatal consonants /ʎ/ and /ɲ/ differs in Catalan and part of Occitan: while Catalan permits them in word-final position, in central Occitan they are neutralised to [l] and [n] (Central Occitan filh [fil] vs. Catalan fill [fiʎ], 'son'). Non-central varieties of Occitan, however, may have a palatal realization (e.g. filh, hilh [fiʎ, fij, hiʎ]). However, Alguerese Catalan neutralizes palatal consonants in word-final position as well. Also, many words that start with /l/ in Occitan start with /ʎ/ in Catalan: Occitan libre [ˈliβɾe] vs. Catalan llibre [ˈʎiβɾə], 'book.' That is perhaps one of the most distinctive characteristics of Catalan amongst the Romance languages, shared only with Asturian, Leonese and Mirandese. 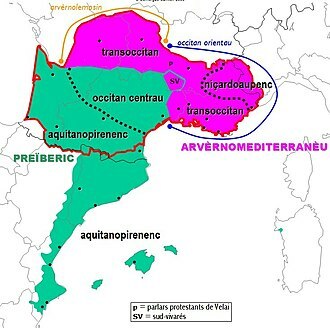 However, some transitional varieties of Occitan, near the Catalan area, also have initial /ʎ/. While /l/ is always clear in Occitan, in Catalan it tends to be velarized [ɫ] ("dark l"). In coda position, /l/ has tended to be vocalized to [w] in Occitan, while remained dark in Catalan. Standard Eastern Catalan has a neutral vowel [ə] whenever a or e occur in unstressed position (passar [pəˈsa], 'to happen', but passa [ˈpasə], 'it happens'), and also [u] whenever o or u occur in unstressed position, e.g. obrir [uˈβɾi], 'to open', but obre [ˈɔβɾə], 'you open'. However, that does not apply to Western Catalan dialects, whose vowel system usually retains the a/e distinction in unstressed position, or to Northern Catalan dialects, whose vowel system does not retain the o/u distinction in stressed position, much like Occitan. Verb conjugation is slightly different, but there is a great variety amongst dialects. Medieval conjugations were much closer. A characteristic difference is the ending of the second person plural, which is -u in Catalan but -tz in Occitan. Occitan tends to add an analogical -a to the feminine forms of adjectives that are invariable in standard Catalan: for example, Occitan legal / legala vs. Catalan legal / legal. Catalan has a distinctive past tense formation, known as the 'periphrastic preterite', formed from a variant of the verb 'to go' followed by the infinitive of the verb: donar 'to give,' va donar 'he gave.' That has the same value as the 'normal' preterite shared by most Romance languages, deriving from the Latin perfect tense: Catalan donà 'he gave.' The periphrastic preterite, in Occitan, is an archaic or a very local tense. The writing systems of the two languages differ slightly. The modern Occitan spelling recommended by the Institut d'Estudis Occitans and the Conselh de la Lenga Occitana is designed to be a pan-Occitan system, and the Catalan system recommended by the Institut d'Estudis Catalans and Acadèmia Valenciana de la Llengua is specific to Catalan and Valencian. For example, in Catalan, word-final -n is omitted, as it is not pronounced in any dialect of Catalan (Català, Occità); central Occitan also drops word-final -n, but it is retained in the spelling, as some eastern and western dialects of Occitan still have it (Catalan, Occitan). Some digraphs are also written in a different way such as the sound /ʎ/, which is ll in Catalan (similar to Spanish) and lh in Occitan (similar to Portuguese) or the sound /ɲ/ written ny in Catalan and nh in Occitan. Despite these differences, Occitan and Catalan remain more or less mutually comprehensible, especially when written — more so than either is with Spanish or French, for example, although this is mainly a consequence of using the classical (orthographical) norm of the Occitan, which is precisely focused in showing the similarities between the Occitan dialects with Catalan. Occitan and Catalan form a common diasystem (or a common Abstandsprache), which is called Occitano-Romance, according to the linguist Pierre Bec. Speakers of both languages share early historical and cultural heritage. The combined Occitano-Romance area is 259,000 km2 and represents 23 million speakers. However, the regions are not equal in terms of language speakers. According to Bec 1969 (pp. 120–121), in France, no more than a quarter of the population in counted regions could speak Occitan well, though around half understood it; it is thought that the number of Occitan users has decreased dramatically since then. By contrast, in the Catalonia administered by the Government of Catalonia, nearly three quarters of the population speak Catalan and 95% understand it. According to the testimony of Bernadette Soubirous, the Virgin Mary spoke to her (Lourdes, 25 March 1858) in Gascon saying: Que soy era Immaculada Councepciou ("I am the Immaculate Conception", the phrase is reproduced under this statue in the Lourdes grotto with a Mistralian/Febusian spelling), confirming the proclamation of this Catholic dogma four years earlier. Tan m'abellís vostre cortés deman, / qu'ieu no me puesc ni voill a vos cobrire. / Ieu sui Arnaut, que plor e vau cantan; / consirós vei la passada folor, / e vei jausen lo joi qu'esper, denan. / Ara vos prec, per aquella valor / que vos guida al som de l'escalina, / sovenha vos a temps de ma dolor. Modern Occitan: Tan m'abelís vòstra cortesa demanda, / que ieu non pòdi ni vòli m'amagar de vos. / Ieu soi Arnaut, que plori e vau cantant; / consirós vesi la foliá passada, / e vesi joiós lo jorn qu'espèri, davant. / Ara vos prègui, per aquela valor / que vos guida al som de l'escalièr, / sovenhatz-vos tot còp de ma dolor. and swims against the torrent." "Born a Provençal, he easily familiarized himself with the dialect of the south. He would say, E ben, monsur, sètz saget? as in lower Languedoc; Ont anaratz passar? as in the Basses-Alpes; Pòrti un bon moton amb un bon formatge gras as in upper Dauphiné. [...] As he spoke all tongues, he entered into all hearts." E ben, monsur, sètz saget? : So, Mister, everything's fine? Ont anaratz passar? : Which way will you go? The Spanish playwright Lope de Rueda included a Gascon servant for comical effect in one of his short pieces, La generosa paliza. John Barnes's Thousand Cultures science fiction series (A Million Open Doors, 1992; Earth Made of Glass, 1998; The Merchants of Souls, 2001; and The Armies of Memory, 2006), features Occitan. So does the 2005 best-selling novel Labyrinth by English author Kate Mosse. It is set in Carcassonne, where she owns a house and spends half of the year. The French composer Joseph Canteloube created five sets of folk songs entitled Songs of the Auvergne, in which the lyrics are in the Auvergne dialect of Occitan. The orchestration strives to conjure vivid pastoral scenes of yesteryear. Michael Crichton features Occitan in his Timeline novel. ^ a b c Bernissan, Fabrice (2012). "Combien l'occitan compte de locuteurs en 2012?". Revue de Linguistique Romane (in French). 76: 467–512. ^ CLO's statements in Lingüistica Occitana (online review of Occitan linguistics). ^ "Page d'accueil". Région Nouvelle-Aquitaine - Aquitaine Limousin Poitou-Charentes. ^ "Reconeishença der Institut d'Estudis Aranesi coma academia e autoritat lingüistica der occitan, aranés en Aran". www.conselharan.org. 2 April 2014. ^ Hammarström, Harald; Forkel, Robert; Haspelmath, Martin, eds. (2017). "Occitan". Glottolog 3.0. Jena, Germany: Max Planck Institute for the Science of Human History. ^ Oxford Advanced Learner's Dictionary (7th ed.). 2005. ^ Friend, Julius W. (2012). Stateless Nations: Western European Regional Nationalisms and the Old Nations. Palgrave Macmillan. p. 80. ISBN 0-230-36179-X. Retrieved 5 March 2016. ^ Anglade 1921, p. 10: Sur Occitania ont été formés les adjectifs latins occitanus, occitanicus et les adjectifs français occitanique, occitanien, occitan (ce dernier terme plus récent), qui seraient excellents et qui ne prêteraient pas à la même confusion que provençal. ^ Anglade 1921, p. 7. ^ Camille Chabaneau et al, Histoire générale de Languedoc, 1872, p. 170: Au onzième, douzième et encore parfois au XIIIe siècle, on comprenait sous le nom de Provence tout le territoire de l'ancienne Provincia Romana et même de l'Aquitaine. ^ Anglade 1921, p. 7: Ce terme fut surtout employé en Italie. ^ Raynouard, François Juste Marie (1817). Choix des poésies originales des troubadours (Volume 2) (in French). Paris: F. Didot. p. 40. ^ Raynouard, François Juste Marie (1816). Choix des poésies originales des troubadours (Volume 1) (in French). Paris: F. Didot. p. vij. ^ Raynouard, François Juste Marie (1817). Choix des poésies originales des troubadours (Volume 2) (in French). Paris: F. Didot. p. cxxxvij. : "Ben ha mil e cent (1100) ancs complí entierament / Que fo scripta l'ora car sen al derier temps." ^ Charles Knight, Penny Cyclopaedia of the Society for the Diffusion of Useful Knowledge, Vol. XXV, 1843, p. 308: "At one time the language and poetry of the troubadours were in fashion in most of the courts of Europe." ^ a b Bec 1963. ^ a b Bec 1963, pp. 20-21. ^ Bec 1963, pp. 20–21. ^ Cierbide Martinena, Ricardo (1996). "Convivencia histórica de lenguas y culturas en Navarra". Caplletra: Revista Internacional de Filología. València (etc) : Institut Interuniversitari de Filologia Valenciana; Abadia de Montserrat (20): 247. ISSN 0214-8188. ^ Cierbide Martinena, Ricardo (1998). "Notas gráfico-fonéticas sobre la documentación medieval navarra". Príncipe de Viana (214): 524. ISSN 0032-8472. ^ Cierbide Martinena, Ricardo (1996). "Convivencia histórica de lenguas y culturas en Navarra". Caplletra: Revista Internacional de Filología. València (etc) : Institut Interuniversitari de Filologia Valenciana; Abadia de Montserrat (20): 247–249. ISSN 0214-8188. ^ Jurio, Jimeno (1997). Navarra: Historia del Euskera. Tafalla: Txalaparta. pp. 59–60. ISBN 978-84-8136-062-2. ^ Cierbide Martinena, Ricardo (1996). "Convivencia histórica de lenguas y culturas en Navarra". Caplletra: Revista Internacional de Filología. València (etc) : Institut Interuniversitari de Filologia Valenciana; Abadia de Montserrat (20): 249. ISSN 0214-8188. ^ Cierbide Martinena, Ricardo (1996). "Convivencia histórica de lenguas y culturas en Navarra". Caplletra: Revista Internacional de Filología. València (etc) : Institut Interuniversitari de Filologia Valenciana; Abadia de Montserrat (20): 248. ISSN 0214-8188. ^ Ghigo, F. (1980). The Provençal speech of the Waldensian colonists of Valdese, North Carolina. Valdese: Historic Valdese Foundation. ^ Holmes, U. T. (1934). "Waldensian speech in North Carolina". Zeitschrift für romanische Philologie. 54: 500–513. ^ "On va parler occitan dans le métro dès la rentrée". ^ Pierre, Bec. (1995) La langue occitane, coll. Que sais-je? n° 1059, Paris: Presses Universitaires de France. ^ Arveiller, Raymond. (1967) Étude sur le parler de Monaco, Monaco: Comité National des Traditions Monégasques, p. ix. ^ Klinkenberg, Jean-Marie. Des langues romanes, Duculot, 1994, 1999, p. 228: "The amount of speakers is an estimated 10 to 12 millions... in any case never less than 6 millions." ^ Baker, Colin; and Sylvia Prys Jones. Encyclopedia of bilingualism and bilingual education, 1997, p. 402: "Of the 13 million inhabitants of the area where Occitan is spoken (comprising 31 départements) it is estimated that about half have a knowledge of one of the Occitan varieties." ^ Barbour, Stephen and Cathie Carmichael. Language and nationalism in Europe, 2000, p. 62: "Occitan is spoken in 31 départements, but even the EBLUL (1993: 15-16) is wary of statistics: 'There are no official data on the number of speakers. Of some 12 to 13 million inhabitants in the area, it is estimated 48 per cent understand Occitan, 28 per cent can speak it, about 9 per cent of the population use it on a daily basis, 13 per cent can read and 6 per cent can write the language.'" ^ Anglade 1921: La Langue d'Oc est parlée actuellement par douze ou quatorze millions de Français ("Occitan is now spoken by twelve or fourteen million French citizens"). ^ Backer 1860, pp. 52, 54: parlée dans le Midi de la France par quatorze millions d'habitants ("spoken in the South of France by fourteen million inhabitants"). ^ a b c d e f "Universal Declaration of Human Rights (Article 1)". Omniglot.com. Retrieved 15 October 2009. ^ "Universal Declaration of Human Rights (Article 1)". Omniglot.com. Retrieved 15 October 2009. ^ a b Kremnitz 2002, pp. 109-111. ^ Kremnitz 2002, pp. 109–111. Ronjat, Jules (1913), Essai de syntaxe des parlers provençaux modernes (in French), Macon: Protat, p. 12 : Mais les différences de phonétique, de morphologie, de syntaxe et de vocabulaire ne sont pas telles qu'une personne connaissant pratiquement à fond un de nos dialectes ne puisse converser dans ce dialecte avec une autre personne parlant un autre dialecte qu'elle possède pratiquement à fond. (But phonetic, morphological, syntactical and lexical differences are not such that a person quite perfectly fluent in one of our dialects would not be able to have a conversation with another person speaking another dialect with an equally perfect fluency). Ronjat, Jules (1930), Grammaire historique des parlers provençaux modernes (in French), Montpellier: Société des langues romanes (Volume 1), pp. 1–32 . ^ Bec 1963, p. 46: The close ties between Gascon and others Occitan dialects have been demonstrated through a common diasystem. ^ "Per Noste edicions". www.pernoste.com. ^ Lluis Fornés, see his thesis El Pensament Panoccitanista Archived 3 October 2008 at the Wayback Machine on Òc-Valéncia's website. ^ Chambon, Jean-Pierre; Greub, Yan (2002). "Note sur l'âge du (proto)gascon". Revue de Linguistique Romane (in French). 66: 473–495. ^ Baldinger, Kurt (1962). "La langue des documents en ancien gascon". Revue de Linguistique Romane (in French). 26: 331–347. ^ Baldinger, Kurt (1962). "Textes anciens gascons". Revue de Linguistique Romane (in French). 26: 348–362. ^ Avner Gerard Levy & Jacques Ajenstat: The Kodaxil Semantic Manifesto[permanent dead link] (2006), Section 10 – Modified Base64 / Kodaxil word length, representation, p. 9: "the English language, as claimed by Merriam-Webster, as well as the Occitan language – are estimated to comprise over 450,000 words in their basic form." ^ Registro de Representantes by Lope de Rueda, in Spanish. Peirutón speaks a mix of Gascon and Catalan. ^ Regional pronunciations: [u(t)siˈtaⁿ], [u(t)siˈtɔ], [ukʃiˈtɔ]. Anglade, Joseph (1921). Grammaire de l'ancien provençal ou ancienne langue d'oc: phonétique et morphologie (in French). Paris: C. Klincksieck. Backer, Louis de (1860). Grammaire comparée des langues de la France, par Louis de Baecker. Flamand, allemand, celto-breton, basque, provençal, espagnol, italien, français, comparés au sanscrit (in French). Paris: C. Blériot. Bec, Pierre (1963). La Langue occitane. Que sais-je? 1059 (in French). Paris: Presses Universitaires de France. Bec, Pierre (1973). Manuel pratique d’occitan moderne (in French). Paris: A. & J. Picard. Gaussen, Yvan (1927). Du fédéralisme de Proudhon au Félibrige de Mistral (in French). Nîmes: A. Chastanier. Kremnitz, Georg (2002). "Une approche sociolinguistique". In Kirsch, Fritz Peter; Kremnitz, Georg; Schlieben-Lange, Brigitte (eds.). Petite histoire sociale de la langue occitane: Usages, images, littérature, grammaires et dictionnaires (in French). Chabrant, Catherine trans. Canet, France: Trabucaire. ISBN 978-2-912966-59-9. Smith, Nathaniel B.; Bergin, Thomas Goddard (1984). An Old Provençal Primer. New York: Garland. ISBN 0-8240-9030-6. Look up Category:Occitan language in Wiktionary, the free dictionary. Eonet.ne – "LexRomEdic", electronic version of Lexique Roman of Rainouard (A provisional version is available).